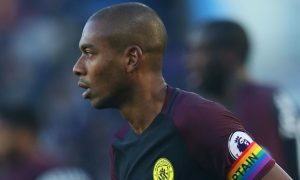 Manchester City could again be without key midfielder Fernandinho for this Sunday’s trip to Southampton and he may be below full fitness for the top-of-the-table clash with Liverpool, according to Goal and ESPN. The 33-year-old hasn’t played since City’s 3-1 win over Everton in mid-December, a match in which he registered an assist, and his absence has been felt with City lacking a viable stand-in for him. It is reported that despite feeling better ahead of the Leicester game, Fernandinho is not certain to feature on Sunday and even worse, could be short of full fitness for the Liverpool game – one City absolutely must win after falling behind Jurgen Klopp’s men in the table. Benjamin Mendy is also weeks away from full fitness, giving Guardiola a headache in both the holding midfield and left-back positions, with Fabian Delph not performing well in the Frenchman’s absence recently and now out for three matches following his straight red card against Leicester. Pep Guardiola has said he will not enter the transfer market next month, but may be tempted to reconsider with a couple of problem areas in the squad. What do you think? Should City buy in January?